Everyone who is a member of the Spartans has a story to tell. If you wish to share yours, send it in! Photographs are welcome, but please ensure that they are not subject to copyright restrictions. The most recent entries are at the top of the page: click on the names below to go directly to earlier stories. I had meningitis when I was 13 months old, and I acquired a profound hearing loss as a result. I started running in about 1989 when I was 13, both at home with my Dad and at school. I hadn’t yet realized it, but hearing loss and running were to become two inextriciably connected aspects of my life. I continued to run semi regularly during my Uni years, including my first Melbourne Marathon in 3:17 in 1997 followed by 2:58 in 1998. School hadn’t been too bad with a profound hearing loss, but Uni was incredibly stressful, given the extreme comprehension difficulties involved. I’m very much a people person, but one of the contradictions imposed by a hearing loss is that dealing with people when you have a profound hearing loss is incredibly tiring. Running was how I coped – it was a good way to take time out from dealing with people and reset my stress & frustration levels at the same time. I joined Melbourne Uni Athletics Club in 1999 and started training a bit more seriously, and this was followed my commencing work with Arup in early 2000. This period of trying to get by in an engineering office with a profound hearing loss was the most insanely stressful period of my life, and it did not help that my employer’s treatment of me was disgraceful. I ended up having a cochlear implant in mid 2002 as I wanted to be able to cope in my job, however I was forced out by Arup just before I had my implant operation, and was thus denied a chance to show that the implant could make a difference. The cochlear implant has made a lot of things a lot easier, and working in a professional office is no longer the stress it once was, but I am still a person with a hearing loss, and background noise and dealing with people for long periods of time is still tiring. 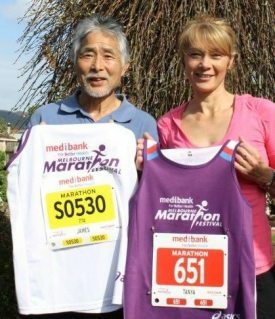 My marathon PB came down to 2:42 in Canberra in 2006, but problems with running out of steam in the last third of the distance were preventing me from running more evenly or quickly!, including in a hosted trip to the Lake Kawaguchi Marathon in Japan with Doug Bourne & Colleen Stephens in 2006 (2:43). I changed my running action to a midfoot strike around about this time. A few changes happened over the next few years – a Masters of Electronic Engineering and a change of coach to Norman Osborne in 2007, and a change of engineering profession to DSP engineering, starting with my current employer in early 2008. Norm (as he was universally known!) set me a more effective training program that combined both volume and quality, and as a result my times came down until I ran a 2:29 in Melbourne in 2009. During this period, I was having major problems with achilles tendonosis (which had been going on for some years), and so I decided to retire from heavy training after the Melbourne Marathon the following year (2:32) – I didn’t want to stuff myself up for the rest of my life! Nonetheless, I continued to run, dabbling in a few ultras for fun – I won the Bruny Island ultra in 2010, ran my 10th Melbourne Marathon in 2011, ran the Surf Coast Century and Great Ocean Walk 100 in 2013, and the GOW again in 2014. I got married in late 2015. In early 2016 my achilles problems got so bad that I had to stop running. I went to physio John Wilson at Alphinghton, and he told me to change my running action back to a heel strike, and do regular calf raise exercises. By the end of the year, I was running over 100 km/week again, and now my achilles problems have cleared up. I’ve been lucky with my biomechanics and genetics – despite being a heavy 42 year old runner, I’m still able to do over 100 km/week of quality regularly, at well over 80,000 km logged. I’m little more constrained in when I can go out running now, as my partner Lizzie & I now have two lovely little boys, but as I live within running distance of work, I’ve been taking full advantage of this! I’d like to have a red hot go at an ultra in the next year or so!, but this will depend on what’s needed at home. The funny thing about being a Spartan is that the older you get and the longer your running CV gets, and even as you start to slow down a bit, it starts to mean a bit more – it grows on you. I even took the recent editorial about wearing the Spartan singlet in other events to heart, and wore it for the Great Train Race this year – it was a great thing to do. In this same year (2013) Kevin and I also completed our first ever triathlon event. 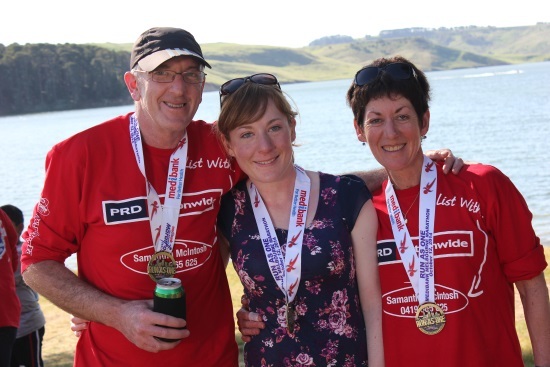 We took on and finished the full Iron Man at Port Macquarie in May 2013. We completed this again in 2014 and have signed up again for 2015. Running is our strongest leg and has provided us with a great base for triathlons now. This year our eldest daughter, Melanie, ran her first full Melbourne Marathon. We have trained together as part of the wonderful Ballarat Tann Clan running group led by Richard Tann. His regime always gets us through. At left is a photo of Kevin, myself and Melanie after the marathon. We all had a great run, Kevin with a PB of 3.22, me with another sub-4 hours at 3.52, and Melanie running 4.14 for her first full marathon. It is so amazing to see so many people running, and hopefully inspiring others to do the same. I think that we only have one Spartan who is a permanent overseas resident. Mitsuo Yonemori completed his 15th Melbourne in 2013 and I am honoured that he has answered some questions. Thank you to Tamami Holmes for her help. Question : You ran your first Melbourne Marathon in 1996 – why did you choose to run this? In 1995 before running the Sydney Marathon which was my first overseas marathon I visited Melbourne with my family. We enjoyed the Penguin parade in Phillip Island and Captain Cook’s cottage and then I became fond of serene Melbourne. In 1996 I again visited Melbourne for business and in those days I got the desire to run The Melbourne Marathon. Question: Japanese runners had competed in previous years winning in 1989, 1994 and 1995. Marathon running has been a proud Japanese tradition – is that something that you believed? I do not think so but marathon is suited for small Japanese, I suppose. Recently marathon runners are running for fitness in Japan. Actually I started jogging for weight loss at forty one years of age and then gradually increased the distances to 5km, 10km, 20km. Then I have got to run the full marathon. Question: You have come back almost every year since 1996 -do you run other marathons? Question: What is the best thing about the Melbourne Marathon? It is just short walking distance from CBD to the start point and the finish line. There are lots of complimentary candy, chocolate, ice block from volunteers. And big cheers from locals. Question: Have you had any memorable experiences in the Melbourne Marathon? In 2002 I could not finish because of diarrhea. Since then I have watched out for food and take antiflatulent Medicine before the race. And also I could not finish in 2005 because I lost on the way. I did not know the course was changed from Albert Park North to Arts Center. After that I have got to pay attention the course changes. Question: What does it mean to you to be a Spartan? I am very proud of be a Spartan. The 1996 was my first Melbourne Marathon. At that time to get Permanent Spartan Number was my aim. Nowadays to take part in the Melbourne Marathon is a kind of once a year reward to myself to always keep trying. And it is good opportunity to brush up my English. I look forward to participating every year. Question: A friend of mine ran a marathon in Japan and she said that there were no cups or gel wrappers on the road, and that there was no mess. Are there other differences that you notice between Australian races and Japanese races? I believe she was lucky. Unfortunately at most of races in Japan it is messy around water stations. I noticed that Australian runners cheer up each other. By contrast Japanese runners make steps in silence. Isn’t it reflection shy Japanese and sunny Aussie? Question: Which is your favourite course? Many Spartans still prefer the original Frankston to Melbourne course. I prefer the recent course. Because it is easy access from accommodation to the start point and the goal and also we can enjoy nice view in Melbourne during running. Question: Your recent times have been faster than 2001, 2003 and 2004 -are you training more now? Since the retirement on June in 2010 I have got spare time for training. Yes, I am training a lot. But recently to avoid injury I reduce it a little bit.I notice I can not run as fast as I grow older. At the start of 2014 I decided that I would like to participate in various marathons around Australia which I had not run before. 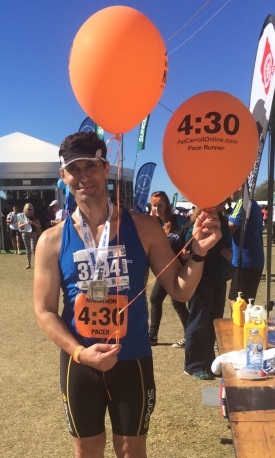 I had always wanted to run in the Gold Coast Airport Marathon due to the warm, sunny weather and it being one of the most well organised and largest marathon events in Australia. Having completed 36 marathons in the past I decided to apply for a position as the 4hrs 30min pacer to help and assist runners reach their goal time. I was selected as the 4hrs 30min group pacer with the aim of maintaining an even pace throughout the entire race to finish at the relevant target time. On the morning of the race I was so excited to be participating in the race as a pacer. I collected my race singlet which had the goal time of 4hrs 30min marked on the front and back. I also collected 2 large brightly coloured orange balloons with goal time on them which I tied to to the top of the singlet. The balloons gave easy visibility to the crowd of runners who could see exactly where their pacer is at all times throughout the run. In the 4hrs 30min group many of the runners were first time marathon runners. Many felt extremely nervous before the run commenced. I would speak to as many runners before and during the run in my group to keep reassuring them, encouraging them, motivating them that they were all doing a magnificent job maintaining the 4hrs 30min pace. Being a warm and sunny 21 degree day I made sure we stopped at every drink station and walked 15 to 20 metres to give the runners a little break which they were very thankful for. By the time I had reached the 32km mark many of my group had dropped out. During the last 10km of the race my group picked up many new runners. I crossed the finish line in Net time: 4:29:47 and Official Time: 4:33:51. I was so thankful that I had purchased the new Garmin 220 GPS watch that kept me on track every step of the way with an average pace of 6:23 per kilometre. Overall, running as a pacer and assisting other runners achieve their goal time has been one of my most rewarding running experiences and I hope to be able to pace again in another marathon soon. I would like to thank a fellow Spartan, Legend Bruce “Digger” Hargreaves, who was the 4hrs 15min pacer in the Gold Coast Airport Marathon. Bruce is a very well known and experienced pacer in marathons who gave me invaluable advice before the marathon about how to be a pacer and all the requirements along the way regarding pacing, drink stations, course layout and usage of GPS watch. 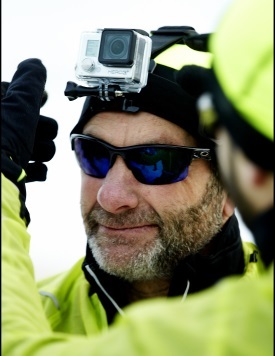 On October 19, 2013 Eric Heine ran the Polar Marathon in Greenland. He was the first Australian home. See here for some marvellous pictures. Eric also completed the Marathon Des Sables in 2015. In 1984, at the age 41, I ran my first marathon: the Melbourne marathon. I had no idea how to prepare for the task and, as ill prepared as I was, I managed a time of 4:35:46. 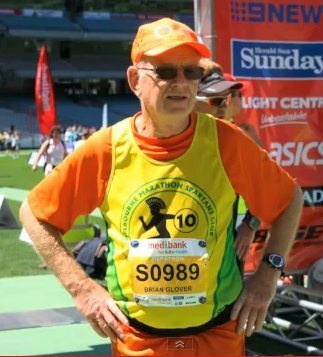 Later my family found me with my head in the gutter unable to respond to their question “Are you all right?” This year, having turned 70 in August, I will be lining up for my 28th Melbourne Marathon and 70th marathon overall. This will be a very special marathon, not only because it’s my 70th marathon at the age of 70, but because my daughter, Tanya, will be participating in this year’s event with me in her first marathon. Although crossing the finish line with Tanya (and we will finish the marathon no matter what) will be something very special for me, the journey towards the event was unique as I trained with Tanya and all our running friends in the beautiful Dandenongs on Sunday mornings in all kinds of weather conditions over countless kilometres up and down the hills. Afterwards we always sat down for a civilised conversation with cups of tea and cakes. That is the moment I enjoy the most. Running is a reflection of my life. James and Tanya are pictured displaying their 2013 race numbers. They ran and finished together. Hi my name is Cyndi Nunn and I’m a runaholic. Born and bred in the beautiful town which is Ballarat. Raised by two families: my blood related family and running family known as the Richard Tann’s, Tann Clan. I started running with the Tann Clan in mid-2001. Initially it was aerobic training for rowing but I soon realised that fitness is secondary. The Tann Clan is all about friendships and this special and inimitable group swiftly become my sanity and social outlet. The unique camaraderie that is formed at 6’oclock in the morning is remarkable. I love the honest conversations that are had on a freezing winter’s morning and equally appreciate the sweaty hugs on a warmer day. The compassion, trust and gratitude we have for one another is honestly indescribable. Above all I consider myself one of the luckiest girls in the world. Not only do I have significant memories of family holidays, Christmas lunch and Easter egg hunts with my parents, but I have had the opportunity to run 100’s of kilometres with my mother and father! Long distance running has not only given me the chance to stay fit and healthy but I have been given multiple opportunities to bond with my parents. From using the facilities on the open road to fulfil toileting requirements and remove any other bodily fluids, to solving all the problems of the world before 8.00 am. I have found that each year when completing the Marathon I am in a slightly different mindset or physical shape to the previous year. Some years it has not been about how quick I can do it, but whether I can do it at all. In 2012 I challenged my personal best time and made myself very proud when finishing the race alongside my youngest brother Conor in 3 hours and 21 minutes. The Melbourne Marathon Spartans Club was formed in 1987 to recognise the level of commitment, dedication and determination it takes to have completed 10 grueling marathons. This is no mean feat. The title of Spartan has now become one of the Melbourne running community’s most sought after titles. Inspired by my very own parents I ran my first Melbourne Marathon at the ripe young age of 18. I have not missed a year yet and if my commitment to training remains strong and positive I will run my tenth Melbourne Marathon in October 2013. In 2009 I ran my mother Jill’s 10th Melbourne Marathon with her. My father Brendan’s health restricted him from running alongside us that year. Besides running the marathon on this day our usual needs, wants and keeping sane duties took place. By the 10km mark we had christened the bushes on the side of the road. At 15km Jill was trying her hardest to encourage me to ‘snot’ on the ground. I refused, but she conceitedly demonstrated to me just how it’s done. A few kilometres later with much persistence I graduated in this skill and made my mum proud. At the 18km mark a 25 year old male supporter on the side of the road exclaimed “hey you, not only do you look good running, but you look awesome in those pink shorts.” My shorts were black: Jill’s were pink. I was so proud of my mum for being hit on in an environment as such. During the final 10km I lost count of how many times Mum said ‘sorry’ to me. I kept telling her not to worry. With a single step we started the 42.2km journey together and we would finish together. Our feet felt like they were on fire. Sweat and tears were streaming down our weary and exhausted bodies. Our pure determination to continue stepping one foot in front of the other time and time again was infectious. We could hear the crowd roaring. The mother and daughter team were getting closer to triumph. Running into the G with my mother was one of the most amazing moments of my life. Never have I felt so much love, pain and happiness all at the same time. My brother Rory was standing at the side line waiting to give Mum the most significant top she will ever wear: her green Spartan singlet. He passed it over. The clock was ticking and it was in our last strides before the finish line that mum pulled her Spartan top over her head. She did it. We did it. Our Marathon journey was complete and it was this moment that I knew I would cherish forever. On the 13th of October 2013 my very own mother Jill will run alongside of me. Our journey will start with a single step. At the conclusion we will have experienced something together truly special and extraordinary. My father Brendan will be standing near the finish line with my Spartan singlet. The three of us will run into the G and cross the famous finish line together. 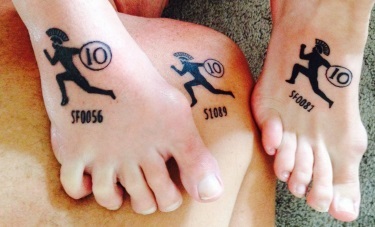 This year, I will become a 10 year Melbourne Marathon Spartan and the number I am given will be my own, always. Cyndi experienced some illness during the year but achieved her aim. The image at left shows the family collection of tattoos in honour of achieving Spartan status. Jon completed 11 Melbourne Marathons between 1979 and 1990, including two in the 2 hours 50 minutes range. This is impressive enough, but it is even more exceptional that he has decided 2013 is the year he should do his 12th Melbourne. He is publishing a daily blog to share his training, racing and injury progress with the world. Well worth a look for anyone seeking some inspiration. Jon duly completed his 12th Melbourne. See his blog for details. 2015 edit Jon has a new blog where he discusses his preparation for other marathons (Paris, Tokyo, …) and ruminates on training and life. I had already completed a number of marathons (VAAA (now AV), Victorian Marathon Club, and Traralgon events) so had some degree of marathon experience already when the announcement was made about the inaugural BIG M Melbourne Marathon. In some respects these races were a tough introduction and, as an example, the VAAA Marathon had a cut-off time of 3 hours 30mins to even be declared a Finisher. My first marathons were VAAA events and after having run four marathons my race times varied from 3h 25m to 3h 29m! In contrast the VMC and Traralgon Marathons were a lot ‘friendlier’ and even (!) included Lady competitors, a significant inclusion back then. But a common theme with the existing events was that they were mostly held in the colder months and we generally completed them with little or no fluid intake. I think that the Boston Marathon in April 1978 had been held in much warmer conditions than usual and the conditions had decimated the general field. The winner had been Canadian Jeremy Drayton who ran in a form of string vest running top. Be warned, these ‘facts’ are from my sixty-year old memory! As the 1978 race was to be in November, heat became a key issue in our pre-race preparation. The experienced marathoners were used to the distance but lots of research (pre-internet!) was done on heat acclimatisation. The experience of the first Big M organising committee (Ted Paulin had an experienced group of Victorian distance runners behind him) established many drink stations should be placed on the course. But we still had to get used to drinking water while on the run. Unlike the range of gels and sports drinks available today, I think Staminade was one of the few supplements available at the time. Also, ‘flat’ coke was another option. But in general it was water only at the drink stations. It ended up that hydration was not a problem in the first Big-M (1979 was very different). For me my obsession was to get a string vest running top like Jeremy Drayton had worn at Boston. The best I could find was get a Norwegian string army vest which I wore in 1978. As an ‘accomplished hoarder’, I still have that vest at home somewhere with the race number still attached! The race started from near Frankston High School so for the first mile we had a slight downhill run till turning right in to the Nepean Highway in Frankston. Then it was straight up the Nepean Highway to Melbourne. As we turned right, with 25 miles to go, I remember some wag calling out “You bewdy, the Home Straight!’ At Mordialloc we went straight ahead, ignoring the later used Beach Road course, and it was getting warmer. The worst patch was near Highett where Nepean Highway was wide and exposed to the sun plus those grotty old Gas tanks (no natural gas back then). With about five miles to go we had the climb up the hill to where Alma Road crosses Nepean Highway. Again that was tough as it is wide open to the sun, a scruffy part of Melbourne, and the climb itself. Over the top and down to St Kilda Junction and then the shade (and pleasant environment) of St Kilda Road. The experienced runners generally picked up the pace for this last section even though tired and ‘kicked home’ to the Finish. St Kilda Road is a great Finishing Straight for a marathon with the shade, the Shrine, and the city skyline. In later years we finished at the Arts Centre which was great. The only downside was the section from Mordialloc to Alma Street. Though exposed to wind, Beach Road is my much preferred route. As described above, I too ‘kicked home’ (reaping the benefits of a great training group and coach Pam Turney) and ran a PB (at that time) of 3hours 7mins. That first BigM is still one of my favourites. The Melbourne public supported it, the State Government (eg. Brian Dixon) supported it, it was a great athletic event, and those BigM girls! They used to have BigM buses (including the BigM girls) to pick up the retirees and they (the buses) looked very inviting on occasions. But, speaking from experience, don’t drink too many BigM milk drinks just after finishing!!!! He has now completed more than 130 marathons, 57 ultra marathons and 21 half marathons. He walks but this doesn’t mean he dawdles: his best Melbourne time is 4h38m. He has completed every Melbourne since 1996. He might retire when he can’t break 6h30m, but since his 2012 Melbourne time was 5h17m the soon to be 71 year old will be adding considerably to his totals. His schedule for May 2013 is the Puffing Billy race then the Go the Extra Mile 50km starting at Jells Park finish at Ferny Creek with the 1000 steps at the 40km mark. 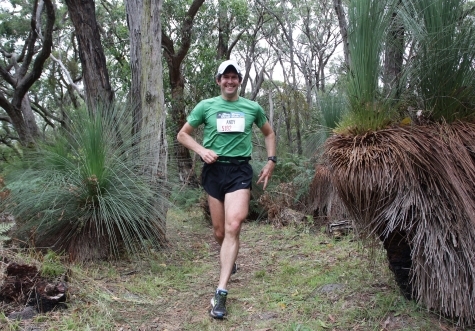 On the Great Ocean Road weekend he will warm up with 6km on Saturday then the 45km on the Sunday. The Barossa Marathon will round off the month. He trains 5 days a week, averaging between 80 and 100 kilometres with longest training walks of 30km. His parents were salvationists and he worked for the Salvation Army as a manager until retirement. He played Trombone in Salvation Army Bands in England and Preston Victoria for over 40 years. Not surprisingly, he has neither smoked nor tasted alcohol. Also not surprisingly, the 20 kilograms has not been regained. He is now a resident of Portland, and is a passionate supporter of local Fun Runs. He has been known to do a Saturday 10 km in Dunkeld and then drive to Ballarat to compete the following day. Brian’s wife Jacqui attends all the events. She ensures that she has drinks available for him at stations in the country events, and her support is a vital component of Brian’s success. The Melbourne Marathon isn’t the only event which he has completed multiple times: Canberra, Traralgon, Wagga Wagga, Shepparton, Marysville, SriChinmoy, Pichi Richi, 3 Bays, Jindabyne, Mudgee, Great Ocean Road also figure prominently in his results. He is a distinctive competitor, not only because he walks, but also because he always wears bright orange tee shirt and shorts. The photograph shows him at the finish of the 2012 Melbourne. 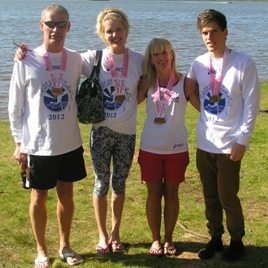 This year (2012), Adrian and Ashley Burt joined their father John as Melbourne Marathon Spartans. This video, made before the run, shows them discussing running marathons. The link is published with the permission of Medibank, the major sponsors of the Melbourne Marathon festival. Here is a link to a recently published article in The Age featuring John Burt in his day job. I joined the Spartans so I could get recognised for my marathon running. 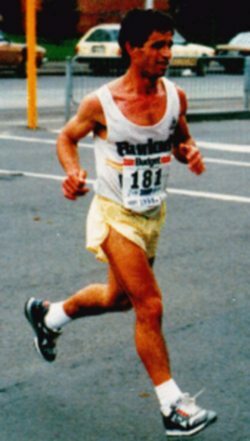 I completed 11 marathons Melbourne Marathons during the period 1982 to 1993, and I had a best time of 2 hours 45 minutes in 1987. I did five under 3 hours and six over 3 hours. I also completed three South Melbourne marathons and two others in Melbourne for a total of 16 recognised marathon runs. I ran one fun run in Sydney, the City to Surf, in 1983. I also did a lot of fun runs, 20 mile Big M warm up, and 30k runs. I have joined a marathon club so that I can focus on marathon running. Now 56 years of age, I am hopeful of finishing my next Melbourne marathon in 4 to 5 hours. I want to get to finishing a target 15 of recognised marathons and get the Spartan blue singlet, and then get to 20 recognised marathons for the red singlet. I have a disability and cannot drive. I have to rely on people’s kindness and generosity to get me to and from the marathons. Gordon Burrowes took me to a number of marathon starts and my brother Freddie came to the finish to pick me up, and support me. My friend Ken Bolitho is my carer, but he needs help as well. I now train 10k a day, 70k a week, I hope that will get me there. Ray completed the 2012 Melbourne Marathon in the excellent time of 3:49:46. He is also a gardener. I began my running life as a young Accountant with ICI – now Orica, where a number of the “old blokes” in the office went out for lunch time runs. The “old blokes” (or so they seemed at the time) were most likely in their early 30’s or 40’s and in training for the Melbourne Marathon. They suggested I join them and I was hooked, due in part to the most spectacular running course they had mapped out. Our run took us down Albert St, East Melbourne through the lush Fitzroy Gardens to Wellington St, through Yarra Park – past the MCG, over the old steel railway bridge to Swan St and around The Tan then back to the office. This was in the days of 1 hour lunch breaks, less pressure to perform and better life balance. I completed my first Melbourne Marathon in 1984, in a respectable time of 3:31:46, being helped on the way by an experienced marathoner. We ran a conservative first half so I was able to finish strongly. I moved on from ICI but the pleasure of lunch time runs never did. At every work place I found a hidden shower somewhere in the factory or warehouse and mapped out a 35 – 40 minute lunchtime run. I’ve worked in many parts of Melbourne – Kensington, Clayton, Maidstone, Airport West, Brunswick and Mt Evelyn and have always been able to find a track to run on – much to the amazement of the staff. I also always travel with a pair of runners, a pair of shorts and T shirt. Running through Hyde Park in summer, past ancient ruins in Rome and the Boulevards of Paris and joining the locals running around Lumpini Park in Bangkok. I qualified as a Spartan way back in 1996 hoping to break 3 hours – I fell agonisingly short of a sub 3 hour with a PB of 3:00:30. My last effort was the Sydney Olympic trial marathon in May 2000 well outside my PB mainly because I didn’t prepare well and had a shocker. I continued running on the fun run circuit running many half marathons, City to Surf, Run for the Kids and Puffing Billy. This year I’ve taken up the challenge of the “Big One” after a long break. (1996 previous Melbourne.) The prospect of running onto the “G” is irresistible. Paul was equal to the challenge, finishing in 3:31:40. Although family habits and natural disposition meant I’d barely broken into a run throughout my adult years, something clicked and I realised that marathon running was exactly what I’ve wanted to do – relatively inexpensive, convenient and the long runs were ideal for avoiding the drudgery of house work. Unfettered by such things as knowledge and experience, I laced-up my first ever pair of running shoes and started my quest for the coveted green singlet. Well, it’s been an amazing journey and like many things in life, the rewards you reap aren’t necessarily the ones you expect. For the uninitiated like myself, a whole sub culture opened up to me: language, clothes, food, diet, injuries, travel and publications. Other runners I met were unfailingly generous with their time, knowledge and experience, offering everything from a kerbside bandaid to a performance enhancing banana. I’ve done many fun runs over the past 10 years but the Melbourne Marathon is something special. It has a fabulous community feel as many of the runners are local yet it draws a huge crowd including many international competitors. The course has varied over the years, like a living creature in tune with the needs and expectations of runners, spectators and media. Becoming a member of the Melbourne Marathon Spartans means much more than just grinding out 10 marathons. It means connecting with the Melbourne running community for a long term relationship, through thick and thin, injury and health! At times I get frustrated being a slow, back o’ the pack kind of runner but it does have benefits: I’m slow but rarely injured, the finish photos aren’t crowded and as long as I maintain my pace and just keep getting older I may be lucky enough to be enjoying Melbourne Marathons decades down the track! My first experience in distance running was the Sun Super Runs in the late 1970s. It started at the MCG and went through the city and over the Westgate Bridge. Then up Williamstown Road until Geelong Road and then along Ballarat Road to Racecourse Road and finished on the Flemington Racecourse a distance of approximately 18 km. In my mid 20’s and early 30’s I continued running but only when the mood took me and did not compete in organized fun runs. Coming up to my 38th birthday my irregular training schedule was no longer keeping me as fit as it had in my youth and I decided to train on a regular basis with no particular goal in mind. In 2001 completed my first Melbourne Marathon and with the exception of 2003/04, which I missed due to a achilles tear, have run all subsequent marathons. In 2010 joined Diamond Valley athletics club and did their winter training program without competing in the AV events, which was a great help in reducing my pb by 9 minutes to 03:10. Last year I competed in the AV cross country season with Diamond Valley, but carried an injury into the Melbourne marathon ruining any chance of a pb. Which brings me to this year’s AV cross country season, all was going well, 1 hour for the 15Km at Ballarat on target for a great time in this year’s Melbourne Marathon, until the following Thursday nights training sessions running drills and pop, it felt like someone had thrown a golf ball into the back of my calf, another injury. I dream of a sub 3 hour marathon, but injuries and age are working against me. Becoming a Spartan is like working towards a goal way off in the distance, kilometer after kilometer, Sunday long runs, training sessions and injuries are all part of it, and whether I do a pb this year or ever achieve my sub 3 hour marathon I will always be a Spartan. Steve finished in a time of 3:06:17, a personal best. I have always liked running. At school (St Bede’s College, Mentone) my sports were distance running, at which I was competent, and football, at which I was very average. My best running achievement at school was to be a member of the cross-country team that won the Victorian U16 Cross Country Championship in 1964 at Caulfield Racecourse. At Monash University I stopped running, continuing to play football (no improvement) and discovered cricket. At CSIRO (Aspendale 1975-1995) there was an active lunch-time running group which I joined to improve my fitness for cricket. Our ‘bread and butter’ run was a 10km. Members of this group introduced me the Peninsula Hash House Harriers (late 1970s), and slowly I rediscovered my running passion. Within the PHHH there were several members of the Peninsula Road Runners, some of whom were training for the Melbourne Marathon – I joined this training group in 1981. 1980-1981 was my last season of cricket and I decided to focus fully on running in 1981. The Table (right)shows the annual training distances, training pace, weight and the times for the 16 marathons (10 Melbourne Marathons) I completed between 1981 and 1992. My first marathon (1981 – 4:10) was a completely new and painful experience. I remember walking from Elwood to Fitzroy Street – I vowed to never let that happen again. 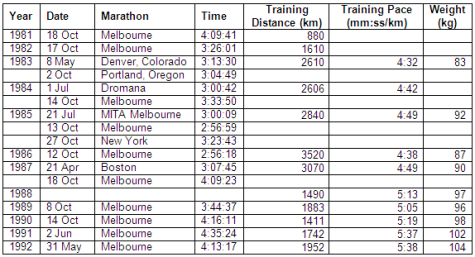 I doubled my training distances in 1982, and my second Melbourne Marathon was run in 3:26 (without stopping!). In 1983 I took a 12 month sabbatical at U. Colorado in Boulder, a Mecca for distance runners (altitude 2000 m). This turned out to the most exhilarating year of running I ever experienced. I ran the Denver Marathon in 3:14, which was a significant improvement, giving the 20% oxygen penalty of running in the ‘mile-high’ city (although lung-capacity increases to compensate – hence the benefit of altitude training). Returning to sea level for the Portland Marathon (Oregon), I recorded 3:05. The data (Table), with my weight at record-low levels (83 kg), suggest I should have broken the 3 hour barrier – I suspect it was mental – not knowing what to do in the race. While in Boulder I ran in the Bolder Boulder, one of the world’s great 10 km road races, breaking the 40 minute barrier (39:45) for the first time. I would go on to run sub-40 min 10 kms 10-15 times, my best being 35:40 in a PRR event in 1986 (1.4 times the then world record). Returning to Australia in 1984, I ran the Sri Chinmoy in 3:01 and knew I was almost there. The heat-affected Melbourne Marathon in 1984 was disappointing (3:34). My weight (92 kg) meant that I was very susceptible to heat stress. It finally happened in 1985. I ran the MITA Marathon (Vic Marathon Championship) in July in 3:00:09. The finish was along the old Olympic Park cinder track, and I remember the dismay of seeing the finishing clock signal 3:00 hrs, 40 metres from the line. All was put right in October, running the Melbourne Marathon in 2:57. Conditions were great that day. Two weeks later I ran the magnificent New York Marathon in 3:25, my time reflecting general tiredness and the impact of a massive field. The New York was a spectacular event – from Staten Island to Central Park, with massive speakers at the start ringing out Sinatra’s ‘New York-New York’, fantastic views from the Verrazano (Staten Island to Brooklyn) and historic Brooklyn (Brooklyn to Manhattan) Bridges, running the Manhattan canyons and finally finishing in glorious Central Park. In 1986 I improved to 2:56 in the Melbourne Marathon, running the first 10 km in under 40 min, and the first half in 87 minutes (2:54 pace). This would be the fastest marathon I would run (also at 1.4 times the then world record).In early 1987, I ran the famous Boston Marathon, starting in the rural countryside west of Boston, running through historic American Revolution hamlets, a beautiful, net down-hill course with the famous ‘Heartbreak Hill’ on the Boston outskirts. Again the big field meant the start was slow, and coupled with jet-lag, meant that my time of 3:08 was acceptable. 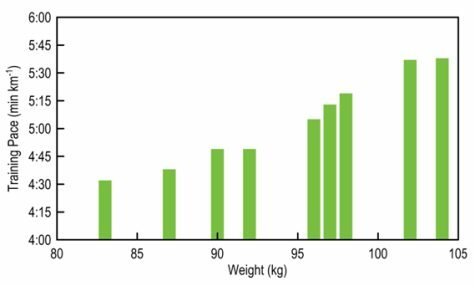 Between 1983 and 1987, I averaged a training regime of 3000 km/yr, keeping my weight down to 83-90 kg. In 1986 I averaged nearly 10 km/day, but it started to take its toll. I missed the 1988 Marathon with a nagging heel-spur injury, and also my knees started to breakdown, and calf strains became common. For my last 5 Melbourne Marathons, my training regime dropped to under 2000 km/yr, my weight increased to over 100 kg, my knees were painful and my times averaged over 4 hr. My marathon days were over, but I desperately wanted 10 Melbourne Marathons to be eligible to be a Spartan, which I achieved in 1992. I tried to keep a modest running program going, but, after 3 knee arthroscopes (2 right, 1 left) from the mid-to-late 1990s, my surgeon threatened not to treat me if I did not stop running. The data in the figure at right show this clear correlation between weight and annual average training pace. 2. Do not use running as your primary means of weight control (as I did) – control your weight through a sensible diet and use running to maintain your fitness. 3. Whenever possible, train on forgiving surfaces – grass, flat sand, tan. 4. Have an alternative fitness activity – bicycling, swimming for example. 5. Maintain flexibility through specific exercising. 6. Use only the very best shoes you can afford. I thank them for their friendship and support. 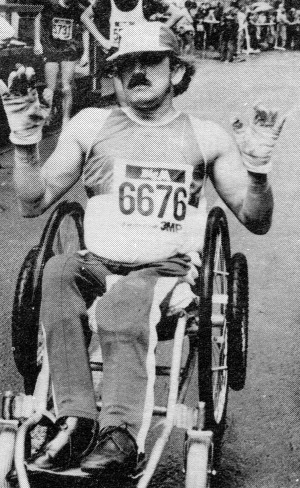 Ian Gainey (left in 1980 and below in 2004) was the first Melbourne Marathon Spartan Wheelchair athlete. In 2004 he achieved his long term goal of completing 20 Melbourne Marathons. 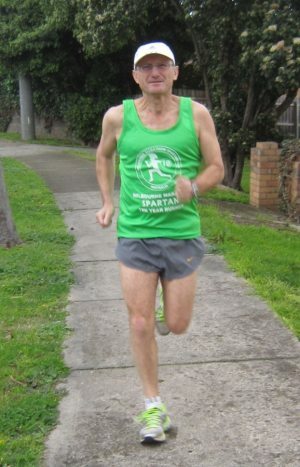 He is now training and concentrating on completing his 24th Melbourne Marathon in October 2012 and wants to reach the “Magic Mark” of 25 within 1 or 2 years. In early 1954, at the age of two, Ian contracted poliomyelitis and was left with paraplegia in both his lower limbs. This has not hindered him nor stopped him from having a full life. His Sporting achievements and highlights have included two Paralympics (London 1984 and Seoul 1988), a 10,000 metres World Record in the 1986 London World Wheelchair Games and many Australian events. He has also participated in more than 12 Marathons and Half marathons in Oita – Japan on the Southern Island of Kyushu. He has raced in England, Germany, Singapore, and the United States of America. He recorded his best marathon time of 1 hour 51 minutes in Japan in 1986 at a time when the world record for the marathon was 1 hour 40 minutes. His first appearance in the Melbourne Marathon was in 1979 when he was one of ten wheelchair entrants. 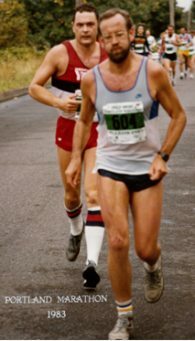 Ian’s best time of 2:01:41 in the Melbourne Marathon was in 1985. ‘Normal’ runners probably envy wheelchair athletes as they fly past in downhill stretches, but uphill and headwinds are challenging, and weaving through packs is especially difficult. He also notes and regrets that the number of wheelchair entrants has dropped significantly from the ten in 1979 to two in 2011. Ian still remembers clearly the original Marathon course from Frankston to Melbourne, and has many regrets that it is no longer possible for organisers to maintain that course. Also a big regret to him is the non availability of an equal or a 30 sec start with ‘able bodied’ Marathon runners. “My very first 42.195K Marathon was the 1979 Big “M” Melbourne Marathon from Frankston to Melbourne and it was a huge challenge not only to finish but what condition was I going to be in when I finished? It was one of my most memorable times because I not only completed it but I competed against some of my idols in the sport of wheelchair road racing. At that time in 1979 I certainly did not ever think that I would do or complete 23 Melb Marathons, there you go. 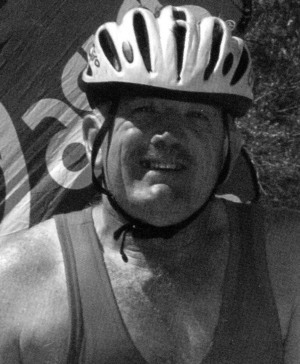 “After being recruited by Paravics staff in 1975, now Disability Sport & Recreation, I enjoyed playing wheelchair basketball for quite a few years, however, the challenges in that sport grew thin and I then wanted to advance to another sport and I chose wheelchair track and road racing and have not regretted it and never will. “Outside of my sporting career I commenced employment with the Department of Defence in April 1973 and I am currently still employed with the Defence Department at Laverton Victoria. Among other interests, I am still involved in umpiring cricket in the summer months and doing a tad of volunteering as a timekeeper for Redan Football Netball Club in the Ballarat Football League. Note Written after the 2018 Melbourne: Ian has well and truly reached his “Magic Mark” of 25 Melbournes and having completed 28, is now closing in on 30. Growing up in Victoria in the 1960s left few options for somebody too light to play Aussie Rules, so running was the go (tennis didn’t seem like a challenge). It was track and field in the summer and cross country in winter. As life went on, study/family/work/injuries all got in the way of running but I still managed to run 20km or so a week. In 1978 I was working at Monash University where a group of us used to run 5km twice a week and play tennis as well (yes tennis really is a sport). I was not up to date with the growth in Fun Runs and the only Marathons I had seen in Australia had been 15 and 20 starters with presentations 3 hours after the start – if you couldn’t run it in 3 hours, everyone had gone home when you finished. 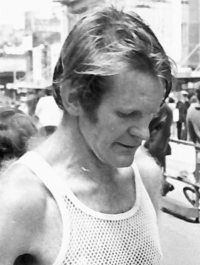 So one day in October 1978 I was puzzled as to why and how a lunchtime running friend actually talked me into running the first Melbourne Marathon. In fact, the organisers talked two thousand other people into it as well. With six weeks warning we were very well prepared – we stepped up the mileage from 20km per week to 40km per week, and one day we actually ran 20km. The race was from Frankston to Melbourne and all runners were transported to the start on special trains, but boy were we prepared. There was no way we were going to finish after everybody went home. We had a race plan to ensure that we finished in under 3 hours. Obviously we had a side bet of a carton on who would finish first; this was now a serious event! We had just a little bit of trouble judging the pace in the first 5km and with our vast experience in distance running, even we knew that 17:30 was a little too fast, so we eased off a bit. At somewhere around the 15km mark, I dropped my partner; so the carton was safe. On we pushed to the halfway mark, where I achieved my 89:00 right on target. We had a little trouble in the second half and went on to finish in 3:18. That is 3:18 for the second half! (i.e. 4:37 finish) Just beyond the halfway mark, for reasons I didn’t understand, my superbly trained body refused to move forward at anything but a slow jog/walk. No matter how much urging I gave it, it refused to proceed. By this time all I wanted to see was the finish line, and as my partner now has a Ph.D, he was clearly of superior intellect, and had calculated that we were averaging between 4 and 5km per hour. This was a bit disappointing, because as bushwalkers we could average up to 6 to 7km per hour. The thought did cross our minds that it may be dark when we finished and everybody might have gone home. By the time we made the tree-lined St Kilda Road, the service lane looked like a retreat from a great battle with hundreds of runners reduced to a walk, limping like the walking wounded (which they were). When we finally reached the finish line outside the Melbourne Town Hall we thought the pain was over, but no. We still couldn’t walk properly until the following Wednesday. Nobody told us about massage etc. While we were drinking that carton in Bourke Street, my partner declared “Never again,” and he hasn’t. Me, well I’ve chalked up about 65 marathons since then, all faster than my first. The Melbourne Marathon has since had some highs and lows. In 1983 they had over 5,000 runners, and now they have 736 ‘ten year runners’ (called Spartans) and 31 ‘nineteen year runners’ (called Gold Spartans). The 20th Melbourne Marathon will be held on 19th October, 1997 which makes it the longest running major city marathon in Australia. Only Traralgon (Victoria) has had a longer continuous marathon record. In 1978 I was sitting in a bar having a drink with two workmates, one of whom had rafted wild rivers, and the other who completed Sydney Hobart yacht races. I was lacking a story, and thought that the inaugural Big M Melbourne Marathon might be an appropriate adventure. My friend Bruce Adcock thought the same and we drew up a training schedule. Few people outside athletics clubs ran marathons at this time, but Bruce knew someone who had completed some, so we tapped his knowledge and regarded ourselves as experts. Bruce and I started together, but I discovered what “hitting the wall” meant and finished in a disappointing time. Next year, Bruce again easily beat me as I recorded an even slower time. Bruce went off to Hong Kong. I became committed to running a reasonable time and spent the next few years trying to improve. 1982 saw many personal bests due to good conditions, and I realised that breaking 3 hours was a possibility. I still hadn’t achieved this goal by 1985, and my times were starting to lengthen. 1986 was dedicated to breaking the barrier. Early in the year, I competed in a few short triathlons, and built fitness through the year. The Corporate Cup was run every fortnight around the Tan and I also became obsessed with breaking 14 minutes. This goal was also elusive. However, for the only time ever, I had done sufficient training to be able to taper properly, and the Corporate Cup before the marathon saw me running 13 minutes 20 seconds. This time, I am immodest enough to say, beats that achieved by all but a very few AFL footballers. The form persisted and I managed to run 2:58:52 a few days later in my 8th Melbourne. In 1987 I learned that there were 88 of us who hadn’t missed a run, and proudly joined the Spartans. Running the Marathon has been part of my year ever since, and forces me to retain some semblance of fitness. I will continue as long as I can.